Do you want to hug a sheep? Mental health problems are far more common than most of us realise; according to a national survey, 1 in 5 students will experience a problem. For this reason, supporting you all with your mental health has been my main focus this year. I’ve spent the year ensuring that SUSU does more than ever before to bring mental health to the forefront of conversation, in order to help you to feel comfortable talking to each other about mental health, and to encourage you to seek out help from the Advice Centre if you are struggling to cope. Mental Health, and in particular, the stigma surrounding it, is one of my key priorities next year as your VP Welfare. I’ve created an Action Plan, in partnership with The University, to layout what we can do over the next few years to tackle the stigma around mental health. Both SUSU and the University will be publicly signing the TIME-TO-CHANGE organisational pledge at the Mental Wellbeing Conference on Saturday 10th May. You can feel incredibly proud to be part of an institution that regards mental health with the importance it deserves, and continually strives towards eradicating mental health stigma, I certainly am! It would be incredible if you’d like to make your own personal pledge, to add to the 58,290 pledges that are already on-line. Chances are that someone you are close to is experiencing a mental health problem, even if they haven’t told you. Take a look at people’s pledges and you might get some ideas as to how you can help them! What have I been doing that you can actually SEE? 1. Planning a conference for you! I’ve been working hard with Wellbeing Officer, Josh Cox, to organise a great day for you all! You can come along for free to try out mindfulness meditation, listen to inspirational individuals speaking about their experiences of mental health and stigma, contribute to discussions on ways we can tackle stigma on campus, and even get a free buffet lunch! Artist, Louise O’Boyle created an art installation on the concourse on Tuesday 6th May, it will be there until Friday 16th May so if you’re walking past, take a look at the figures and keyrings, it may encourage you to think about your perceptions of mental health, the language you use, and the behaviour you display towards people experiencing a mental health problem. I learnt something on the very first keyring I turned over…. I hope you do too. During this week, the lovely student volunteers on Wellbeing Committee have organised information, activities & competitions on the concourse for you to get involved with every day! They’ll also be giving out stress-cubes printed with the 5 steps to wellbeing, to remind you to look after yourself! So say hi to them on your way through SUSU and take a minute or two to think about your wellbeing! Students are also more likely to talk to their friends about their problems which is why its essential that we spread the word, especially before exams! Remember, everyone has the power to make a difference to someone’s life no matter if that’s texting a friend you haven’t spoken to in a while or making dinner for someone you know who is dealing with depression. The wonderful student volunteers from Southampton Student Minds group are launching the National ‘Look After Your Mate‘ , to help you in supporting friends with their mental health. Look out for the volunteers in their white and orange t shirts who will also be handing out 1000 goody bags to passers by with information, a chocolate and a tea bag! Check out the Facebook event HERE! We know that exams can be a pretty stressful time with long days revising and not much time-out to rest your mind! This summer we have organised a variety of activities that you can come along to for FREE! We hope that you’ll come and have a break from your work to switch off for a while…. and why not encourage a friend to take a break and bring them along with you?! 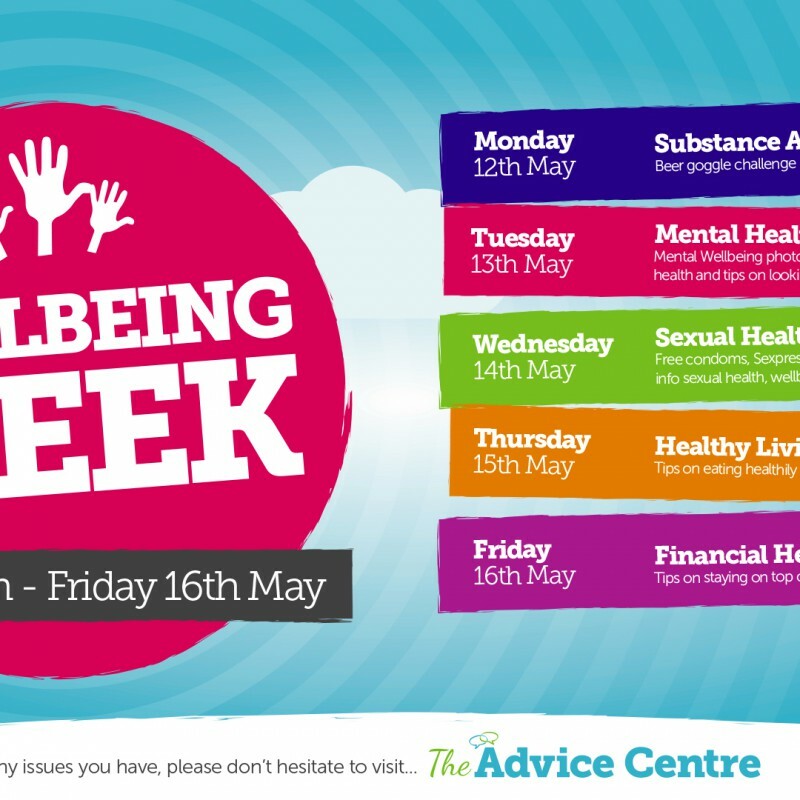 On Monday 19th May SUSU will be giving you a free banana each, as well as some helpful wellbeing tips. On Wednesday 21st May you can let off some steam on the inflatable bungee-run on the redbrick area, and if you are having issues with your laptop, you can bring it along to the concourse for mega discounted rates from Tech Bods! On Thursday 22nd May you can challenge your friends to release some stress in a Sumo wrestle or a gladiator duel on the redbrick! (Sensible duels only please)! On Friday 23rd May you can pop along to the concourse between 11am and 3pm to chill out on some comfy beanbags and watch the Big Bang Theory! I’ll leave you with the 5 steps to wellbeing which should be particularly helpful during this stressful period; but I hope these steps will help you to look out for your wellbeing throughout your lives! No Comments on "Do you want to hug a sheep?"